Budweiser has a boat on the Moscow River and a disco. Coke set up an interactive sculpture-video installation in Gorky Park and entertained 5,000 guests during the monthlong tournament. Visa built a campaign around former Sweden star Zlatan Ibrahimovic. Business went on at the World Cup without the presence of the United States, although the tournament's visibility decreased across America. "The absence of the U.S. team here doesn't change what we're doing," said Ricardo Fort, The Coca-Cola Co.'s head of global sponsorships. "The real value is based on how broad our programs are implemented. We have over 180 countries doing work." FIFA said after the group stage that of 2.6 million tickets sold, U.S. residents bought about 97,000 on FIFA's website and from its ticketing centers, second only to host Russia's 1.1 million. The U.S. was second to host Brazil in 2014, but the American total was around 200,000 that year. "We were all disappointed when the U.S. team didn't qualify," said Brian Perkins, vice president of global marketing for Budweiser at Anheuser-Busch InBev. "But two-thirds of the sales of Budweiser globally are sold outside of the U.S., so actually the bigger part of the business is international, and that's where all the growth is coming from as well. It really didn't change much at all." World Cup advertising increased sharply in the U.S. during the past few tournaments. Nike used a 70½-foot advertising board near New York's Penn Station and its store windows to attract attention. Plans for U.S. marketing changed last October when the U.S. lost at Trinidad and Tobago, ending a string of seven straight World Cup appearances dating to 1990. "Since Team USA will not be competing, we don't have much going on," Nike spokesman Ilana Finley said in an email. Past World Cups contributed to soccer's growth in the U.S., both at Major League Soccer and at the youth level. The four matches involving the American team in 2014 were seen by 10 million to 18 million viewers on ESPN and generated what then-U.S. Soccer Federation President Sunil Gulati called "water-cooler talk." That opportunity was lost in this four-year cycle. Fox, which holds U.S. English-language television rights, had been projecting four of 64 matches involving the American team. "We had to pivot quickly," Fox Sports senior vice president of ad sales Mike Petruzzi said. While viewers declined from the 2014 tournament in Brazil, the level is up from the 2010 World Cup in South Africa when the U.S. games are factored out. "You are naturally going to have more people paying attention back home when your country is in the tournament, but there has still been a ton of interest in the World Cup in the United States," current USSF president Carlos Cordeiro said in an email. "That clearly shows how the game has grown over the years." Visa is using the World Cup to expand the use of near field communication contactless payment technology and brought Ibrahimovic, now with MLS's LA Galaxy, to Russia for the tournament's first week for promotion. 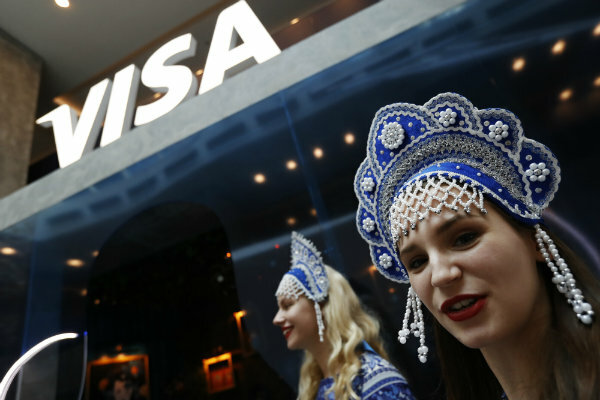 "Some of the biggest amount of spending that we're seeing in Russia is coming from American fans who travel to Russia to see the World Cup in person," said Chris Curtin, Visa's chief brand and innovation marketing officer. Visa's data backed up an impression the percentage of fans from Europe was lower than at past World Cups. Part of the cause may be tension between Russia and western European nations that followed Russia's invasion of Crimea and military intervention in Ukraine, and accusations by Britain that Russia was behind the poisoning of a former spy living in England. Through the semifinals, $12 million was charged inside the stadiums to Visa cards issued to cardholders in Russia, followed by those issued in the U.S. ($3 million), Mexico ($1.5 million), China ($1.1 million), Argentina ($700,000), Peru ($560,000), England ($550,000), Brazil ($500,000), Colombia ($420,000) and Australia ($400,000). France was 13th at $230,000 heading into Sunday's final against Croatia. FIFA has seven top-level partners in Adidas, Coca-Cola, Gazprom, Hyundai, Qatar Airways, Visa and Wanda Group, plus five second-level sponsors: Anheuser-Busch, Hisense, McDonald's, Mengniu Dairy and Vivo. Hisense, Mengniu, Vivo and Wanda are all Chinese companies, a sign of that nation's increasing influence in soccer despite the lack of success of its national team. Among the official FIFA group, Adidas, Anheuser-Busch, Coke and McDonald's purchased about 20 percent of Fox's advertising inventory and sponsorships, and Hisense sponsored clock wraps, billboards and graphics, according to Petruzzi. They were joined by tech companies Amazon, Apple and Google. Coke, Sprint and Volkswagen advertised on U.S. Spanish-language coverage on NBC Universal's Telemundo network. Four years from now, the World Cup will be in Qatar, which like Moscow will also be seven hours ahead of Eastern time. The change will be the timing, Nov. 21-Dec. 18, a tournament shortened from 32 days to 28. "Fourth quarter has got a lot of rating points already with college football, NFL, so it's going to be very interesting how we approach it," Petruzzi said. "The holiday stuff will be great, but I also get cautious about fourth quarter because there's so many rating points out there." The World Cup soccer final where France defeated Croatia was seen by just over 16 million people in the United States on Sunday. U.S. English-language television viewers for the World Cup's round of 16 in Russia were down 27 percent from four years ago, leaving the tournament 38 percent below 2014's level. How much scandal is too much scandal? Wondering how to drive it like Dempsey, move it like Messi or rip it like Ronaldo?